It’s a fact of an author’s life that they will have to promote their book – book tours, extra materials for blogs and social media, and angles they or their publicists can exploit. Often, however, writers treat the writing and the marketing as two separate phases. I’ve done this myself, and the result is time lost going back over the book mining for pull quotes, reviewing endless emails and notes for the tidbits that make good interviews, or struggling to remember who helped with what scene. 1. Have one copy with all your commentary: Who gave you the idea? What links did you go to for research? Was there a scene you cut you can use as an extra? How did you come up with this scene? This will help you immensely when doing your acknowledgements page and for interviews, etc. Use the Comments function of your word processor or stuff it into the appendix. 2. When you’re in the final editing stage, copy and paste one-liners that might make good Tweets or Facebook posts. Tweets need to be about 100 characters so you have room for the link of the book later. Put these in a file. I aim for 30 so I can post one a day for a month. 3. Pick out three short scenes and three long scenes that will make good excerpts. Pick a couple that will make good read-alouds. 4. If you do an online book tour, people will want you to guest post, often about something to do with the writing of the book. When you have 15 blog posts to write in a couple of weeks, it can get hard to come up with ideas. Therefore, if something about what you’re writing at that moment strikes you, make a note, write a short paragraph, or do an outline and save it in a promotions file. Some examples: special research, a sudden insight that fed a scene – or insight about a scene that impacted you personally - something new you learned or tried while writing. Keep these in your annotated file or put them in a separate document. 5. Jot down the answers to these questions because they will be asked during tours. Yes, do it now, because it may be a year or more before the book is published, and you will hopefully have written more books as well. Things get blurry and jumbled in the memory. * What was the best part of writing this? * What was the worst? * Did you have any issues you had to research or rewrite? * Did anything/any character surprise you? * Any funny stories associated with writing this book? Marketing is never an easy thing, but it can be fun. We had a good time prepping for the I Left My Brains in San Francisco audiobook tour. It was easier because I already had a lot of materials prepared. I hope these tips can make your marketing experiences more enjoyable as well. Exterminations have been called in to take out a zombie." Kelsey smiled big for the camera. "And there you have it! Looks like a mime isn't such a terrible thing to waste after all. 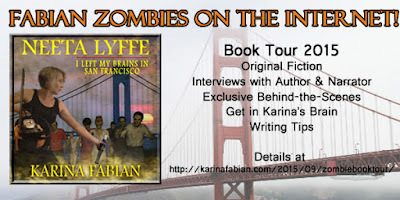 Winner of the Global eBook Award for Best Horror (Neeta Lyffe, Zombie Exterminator), Karina Fabian’s writing takes quirky tales that keep her--and her fans--amused. Zombie exterminators to snarky dragons, things get a little silly in her brain. When she’s not pretending to be an insane psychic or a politically correct corpsicle for a story, she writes product reviews for TopTenReviews.com and takes care of her husband, four kids and two dogs. Mrs. Fabian teaches writing and book marketing seminars online. Karina, it's a pleasure. You have some great book marketing tips to begin before the book is even done! These are great ideas. I tend to do more of this after the fact too, but during would be much easier. And cut scenes as extras...like on websites, etc...cool! Like deleted scenes on DVDs. YW! The DVD analogy is a good one. The book’s still not up on Audible. We're not sure what the holdup is, but we'd like to offer everyone something in the meantime, lest you all go after our brains! We have the first 3 chapters of I Left My Brains in San Francisco for you in audio. If you go to http://karinafabian.com/freezombiefiction/ and sign up, I"ll invite you to the shared drive and let you know when to book is live. PLUS, I'll put you in for a drawing for a free audio copy of Neeta Lyffe, Zombie Exterminator.